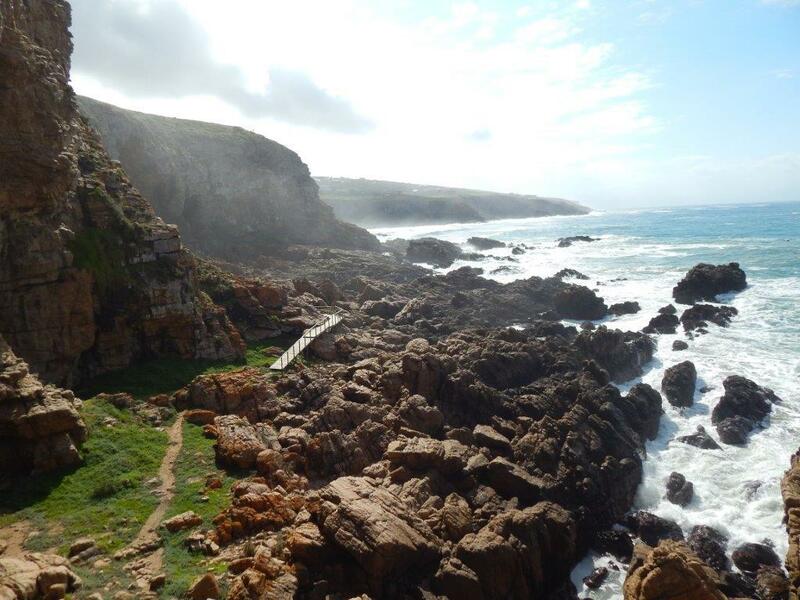 Pinnacle Point is a small promontory immediately south of Mossel Bay, a town on the southern coast of South Africa. 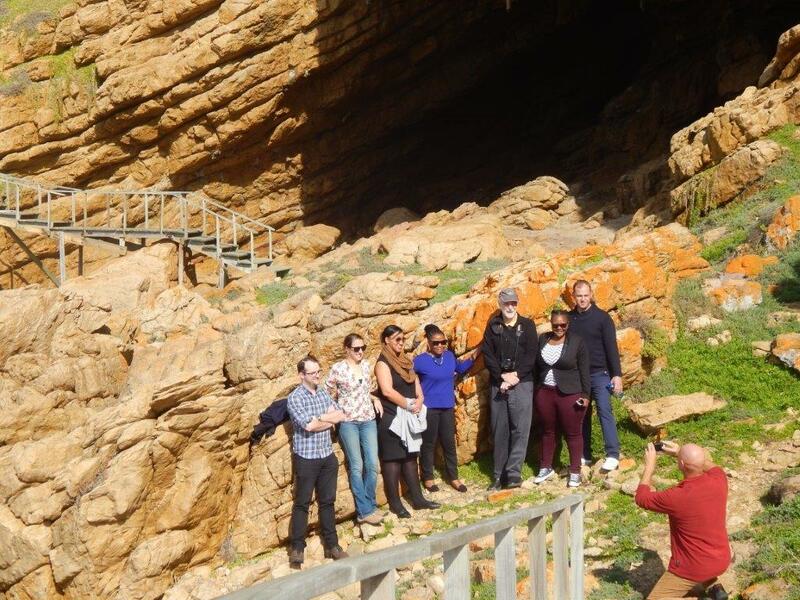 Excavations since the year 2000 of a series of caves at Pinnacle Point have revealed occupation by Middle Stone Age people between 170,000 and 40,000 years ago. The focus of excavations has been at Cave 13B (PP13B), where the earliest evidence for the systematic exploitation of marine resources (shellfish) and symbolic behavior has been documented,and at Pinnacle Point Cave 5-6 (PP5–6), where the oldest evidence for the heat treatment of rock to make stone tools has been documented.The only human remains have been recovered from younger deposits at PP13B which are ≈100,000 years old. After debating for decades, paleoanthropologists now agree there is enough genetic and fossil evidence to suggest that Homo sapiens evolved in Africa ca. 200,000–160,000 years ago. At that time, the world was in an ice age, and Africa was dry and arid. As archaeological sites dating to that time period are rare in Africa, paleontologist Curtis Marean analyzed geologic formations, sea currents, and climate data to pinpoint likely archeological sites. 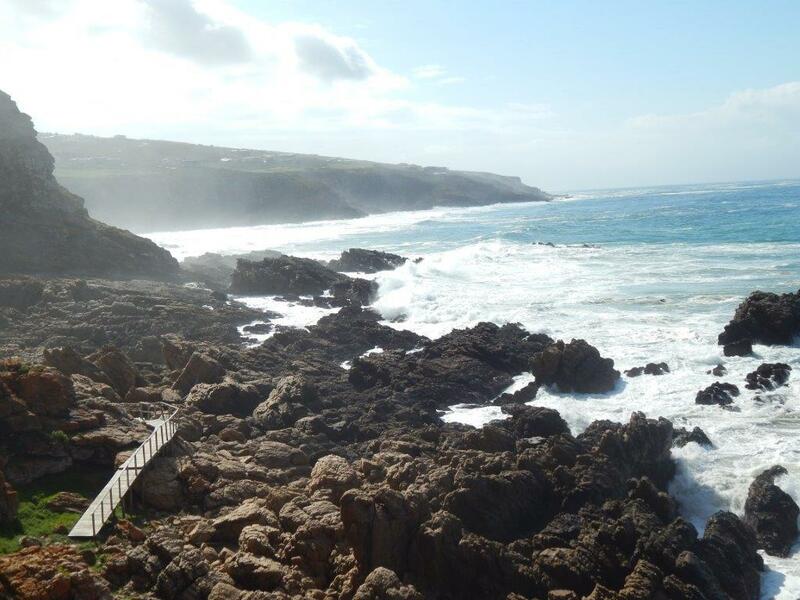 One of the destinations was Pinnacle Point. At PP13B, the evidence for symbolic behavior comes in the form of scraped and ground ochre (a naturally occurring bright red rock) that may have been used to form a pigment for body painting. This is similar to more complex ochre utilization known from Blombos Cave slightly farther to the west at roughly 70,000 years ago.These discoveries contradict the classical hypothesis that the modern behaviour emerged only 40,000 years ago and was reached through a “large cultural leap”.The harsh climate and reduced food resources may have been why people moved to the shore at Pinnacle Point, where they could eat marine creatures like shellfish, whale, and seal. 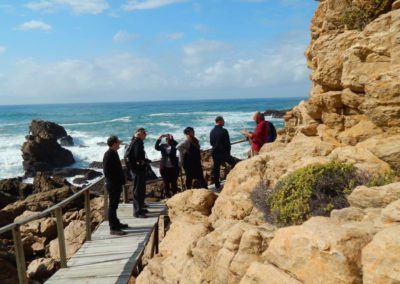 The declaration was made in terms of section 27 of the National Heritage Resources Act (Number 25 of 1999), and was announced in the Western Cape Government’s Provincial Gazette. 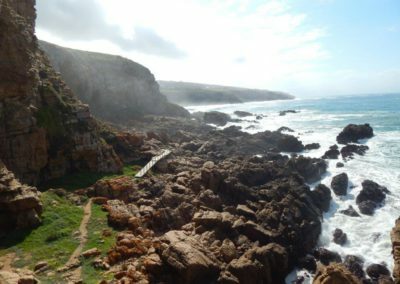 “This is a significant step towards having Pinnacle Point declared a World Heritage Site,” said Professor Curtis Marean, who heads the South African Coastal Palaeoclimate, palaeoenvironment, Palaeoecology, and Palaeoanthropology (SACP4) Project, which is studying the finds from Pinnacle Point. Prof. Marean is an associate director of the Institute of Human Origins and professor at the School of Human Evolution and Social Change at the Arizona State University. “Pinnacle Point is significant because it’s a uniquely dense concentration of well-preserved archaeological sites which contain a record of human occupation over a period of about 170,000 years – from the time when modern human behaviour first emerged to the pre-colonial period,” he said. The archaeological remains first came to light during an environmental impact study of a portion of land that would later be developed as the Pinnacle Point Beach and Golf Resort. The 1997 survey by Dr. Peter Nilssen – of the Iziko South African Museum – revealed a number of stone age sites as well as evidence that humans had inhabited the caves in the cliffs below the present-day Pinnacle Point Club House for tens of thousands of years. 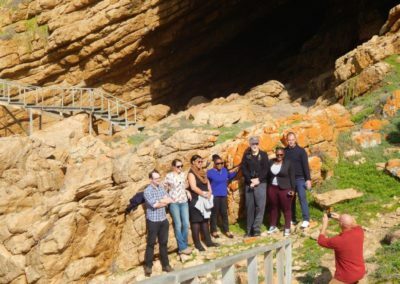 Prof. Marean began researching the Pinnacle Point Caves in 2000, and announced the initial results of the SACP4 Project in a paper which he co-authored with Dr. Nilssen and ten others.